Figure 7-28.-Steel in place in a wall. Home > Construction Training Manuals > Builder 3&2 Volume 01 > Figure 7-28.-Steel In Place In A Wall. The use of metal supports to hold beam- reinforcing steel in position is shown in figure 7-27. Note the position of the beam bolster. The stirrups are tied to the main reinforcing steel with a snap tie. Whenever possible, you should assemble the stirrups and main reinforcing steel outside the form and then place the assembled unit in position. Wood blocks should be substituted for the metal supports only if there is no possibility of the concrete becoming wet or if the construction is known to be temporary. 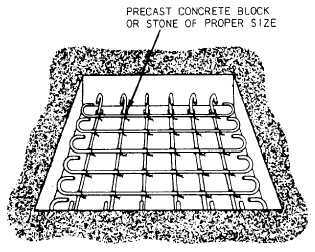 Precast concrete blocks, as shown in figure 7-23, may be substituted for metal supports or, if none of the types of bar supports described above seem suitable, the method shown in figure 7-24 may be used. Placement of steel in walls is the same as for columns except that the steel is erected in place and not preassembled. Horizontal steel is tied to vertical steel at least three times in any bar length. Steel in place in a wall is shown in figure 7-28. The wood block is removed when the form has been filled up to the level of the block. For high walls, ties in between the top and bottom should be used. 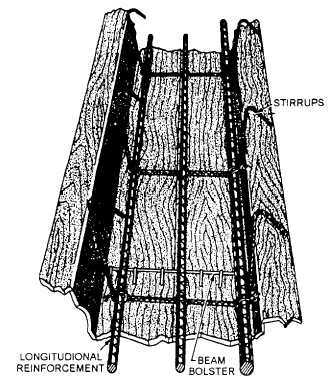 Figure 7-27.-Beam-reinforcing steel supported on beam bolsters. proper distance above the subgrade. Steel mats are generally preassembled and placed in small footings after the forms have been set. A typical arrangement is shown in figure 7-29. Steel mats in large footings are generally constructed in place. 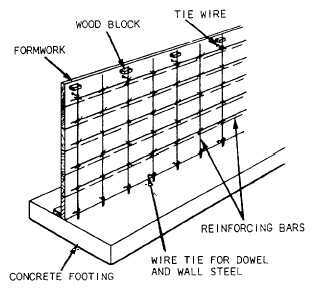 Welded wire fabric (figure 7-30) is also used as limited reinforcement for concrete footings, walls, and slabs, but its primary use is to control crack widths due to temperature changes. Figure 7-29.-Steel in place in a footing.